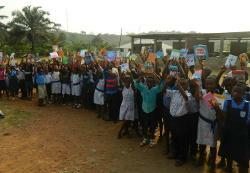 Volunteers Asked to Bring-A-Book to Ghana! 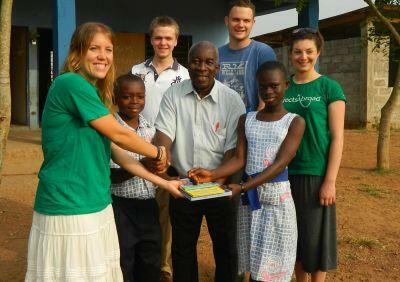 Our first donations from the Bring-A-Book program were presented to Apostolic Preparatory School in Ghana last month by volunteers, Hannah Pascoe-Smith, Harrison Swaine and Thomas Haynes. Bring-A-Book is a program in which volunteers are asked to bring English children's books with them when they arrive in their destination countries. Once we have collected around one hundred books, these books will then be donated to a school in need of a library. Thanks to the donations of recent volunteers in Ghana, nearly one hundred books were donated to Apostolic Preparatory school so they can begin their own library. In Ghana, volunteers on our Building project are currently constructing a library for the Wonderful Love Village in the Akuapem Hills. This community library should be finished in the coming months and when it is, it will be well-stocked with the donations of our volunteers!